Equal parts sugar and tradition, holiday desserts the world over have stood the test of time. And what could be sweeter than experiencing a festive cake or cookie in the very place where it originated? As a travel editor and pastry chef, I always sample the local sweets wherever I go, learning everything I can about their fascinating histories and sometimes heading behind the scenes to see how they are made. You can, too. From witnessing a German baker knead dough into a classic Christmas fruitcake to indulging in jelly-filled Hanukkah doughnuts in Israel, here's the story on 14 internationally loved holiday treats and ways to enjoy them when you travel. In Germany, few holiday treats stand out more than the Dresdner Christstollen. With a history dating back to medieval times, the sweet, enriched yeast cake has been cherished for centuries, especially once a pleasure-crushing butter ban was lifted in 1491. Since then, locals have made sure the stollen is baked with ample portions of all the luxe ingredients, from clarified butter and full-cream milk to candied citrus peel, sultanas, almonds, spices, and spirits (usually rum). Still handcrafted from old family recipes, each loaf is kneaded, rolled, proofed, and shaped into a tapered oblong roll with a ridge down the center (to represent the Christ Child in swaddling clothes), then dusted with powdered sugar to form a snow-white crust that melts in your mouth upon impact. Stollen season runs from October through December, but try to resist eating the cake too soon, as its flavors meld better the longer it ages. 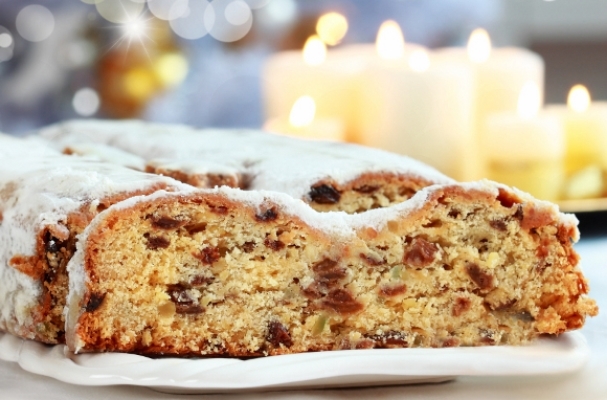 Where to Find It: There are multiple ways to experience stollen in Dresden. I went behind the scenes with the master baker at Schaubackerei Scheinert to learn how it's made—and to taste it; however, many of the city's other authentic bakeries sell the cake and offer baking demonstrations. There's also an annual festival, during which the highlight is a multiton giant stollen. Down Under, Christmas occurs during the hot summer months. 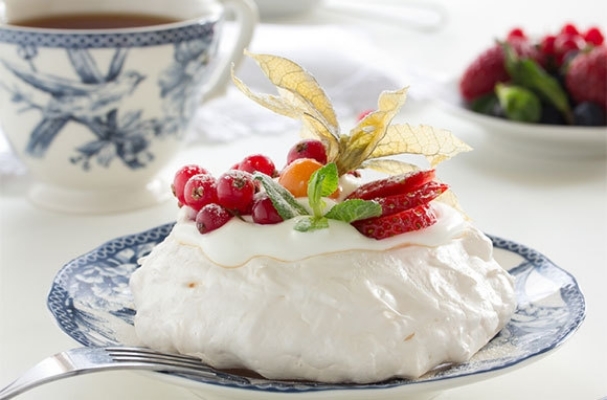 So, as an alternative to rich holiday puddings, the lighter pavlova delights as a popular dessert of choice. Angelic it may be—with an airy meringue base and toppings of fresh whipped cream and seasonal fruits like kiwifruit and strawberries—it doesn't come without controversy. Both Australia and New Zealand claim the origin of the dessert, which dates back to the 1920s when Russian ballerina Anna Pavlova (after whom it is named) visited, and the debate has raged on for almost a century. Aussies say it was invented in her honor at the former Esplanade Hotel in Perth, while the Oxford English Dictionary gives the nod to New Zealand based on a recorded recipe from 1927. While a resolution may never be reached, the good news is that you have two countries in which to enjoy sugary pavlova. Where to Find It: Although many Kiwis and Aussies contend that their "mum" makes it best, there are many restaurants and cafes where you can sample it—both in its classic form and with new twists. (I even found it at a traditional Maori ceremony.) For example, Floriditas in Wellington, New Zealand, has a brown sugar pav with blood orange and strawberries. In Australia, Rockpool Bar and Grill (with locations in Melbourne, Perth, and Sydney) makes a passion-fruit version, and Mojo (in Sydney) offers a contemporary take in the form of a soft Swiss meringue with fresh berries. Cupola shaped, with a tall base and golden dome, panettone has been a Milanese labor of love since the 15th century. Sweet and buttery, this light holiday bread studded with raisins and candied citrus rind is the result of a long production process that requires a natural yeast starter and at least three risings, which can take days. 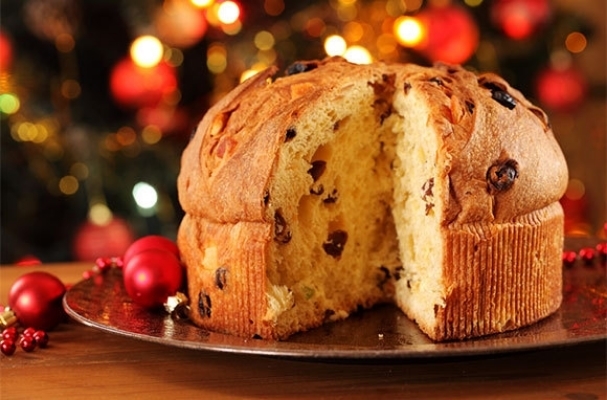 There are many legends about how panettone came to be (mostly tales of romance—after all, this is Italy), but all that's certain is that there is a lot to love about the special treat. In fact, it's so adored that local bakers fought to protect it from foreign imitations; now designated D.O.P. (which stands for Protected Designation of Origin), it must be crafted according to strict standards. Although there is only one true way to make it, there are seemingly endless ways to eat it: in torn pieces, toasted, with butter or whipped cream, or paired with a glass of Prosecco or dessert wine like Moscato d'Asti. (I admit to making it into French toast.) Traditionally, it is placed on a warm radiator a little while before serving to bring out its alluring aromas. Where to Find It: While panettone is often produced industrially, you can still buy artisanal versions at local Milan pasticcerie, including Cova, which dates back to the early 19th century and uses a recipe that's been handed down for generations, or Marchesi, one of the city's oldest and most well-known coffee and cake shops. Potato latkes may claim dominance in the U.S., but the choice Hanukkah snack in Israel is decidedly sweeter. 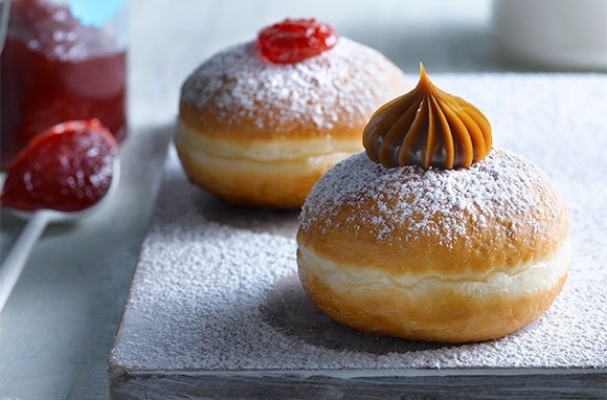 Yeast-risen and pillowy, Israeli sufganiyot resemble doughnuts and are classically filled with strawberry jelly or sometimes caramel (known as ribat chalav in Hebrew) and coated in confectioner's sugar. Deep fried in oil, they symbolize the Hanukkah miracle of menorah oil that lasted for eight days instead of one inside the defiled temple. While seemingly modern, these traditional doughnuts stem from a mix of Western European and Middle Eastern influences and are likely related to fried fritters that were eaten back in the 12th century. Today, sufganiyot are as popular as ever—so much so, that the buying season has stretched from one week before the start of the holiday to three. Where to Find Them: The famous Israeli bakery chain Roladin supplies gourmet-style sufganiyot at more than 40 locations throughout the country. Flavors come in classic jelly as well as creative variations like milk-chocolate fenugreek and cherry with a pistachio crumble crust. The shop also offers a series of trendy "chaser" doughnuts with pipettes of liquid—like raspberry rosewater—inserted into the tops. The Israeli newspaper Haaretz recently compiled a list of other worthy places to find sufganiyot in Tel Aviv and beyond. For me, growing up in a Polish-American family, Christmas Eve always came with a rush of sweets (namely makowiec, a poppyseed roll, and chrusciki, fried bowties drenched in powdery sugar). However, I've since learned that if you go to Poland, the one can't-miss holiday treat is pierniki, the famed gingerbread of Torun. This Hanseatic town—known not only for the spicy cake but, incidentally, for also being the birthplace of astronomer Nicolaus Copernicus—was perfectly positioned along a medieval trade route, giving it easy access to necessary spices like ginger, cardamom, clove, and nutmeg. Add honey from fields along the Vistula River and the flavorful signature delicacy was born. Even Polish composer Frederic Chopin couldn't resist it. Torun bakers have been making gingerbread since the 1200s, and current recipes are based on 16th-century methods. Traditionally, the dough was molded into elaborate shapes with royal or biblical themes (most famously a horse-drawn carriage), but other shapes are common today. Where to Find Them: At Zywe Muzeum Piernika, a fully functional 16th-century gingerbread factory and museum, you can participate in the action by seasoning the dough according to a 500-year-old recipe and rolling it out under the watchful eye of a gingerbread master; you'll receive a special certificate for making the treat. Just want a taste? You can find gingerbread at the many shops in town, including Kopernik SA, which has been baking it since 1763. When it comes to holiday traditions, the French do what they do best: Make it all about food. Once an actual log burning in a fireplace on Christmas Eve—to celebrate the days starting to get longer—the buche de noel has been transformed over centuries into an edible yuletide cake. 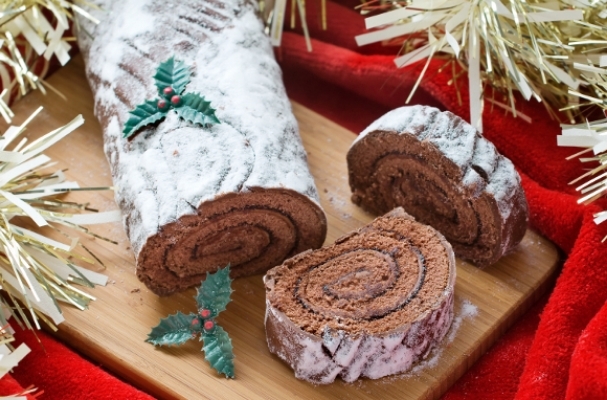 Instead of wood and bark, the buche de noel (or "yule log") consists of a thin genoise sponge that's spread with a sweet filling, rolled into a roulade, and piped with buttercream. Score marks are made with a fork to resemble tree bark, and decorations such as meringue mushrooms and marzipan holly evoke the forest floor. Often, a "stump," with its exposed swirl that looks like wood grain, is cut from the cake's edge and placed on its top to form a "knot." In classic flavors such as coffee, praline, chocolate, and chestnut, this "log" tastes nothing like sawdust. Where to Find It: While making yule logs at home has become a revived trend in France, elaborate gourmet versions still dazzle in patisserie windows. In Paris, Pierre Herme (one of my favorites) is showcasing several buches this year, including a rum-soaked hazelnut variation and one with vanilla and mascarpone cream. Arnaud Delmontel's 2013 edition, with tropical flavors of coconut and pineapple, shocks in neon green. Vanity Fair and Sortiraparis have compiled slideshows of other top Christmas logs around the city. In many cultures, the king cake (or Twelfth Night cake) reigns supreme as a holiday dessert. In Portugal, it's called the bolo rei and has become a national institution. Made to resemble a crown, the rich, sweet brioche-style bread is formed into a circle and then adorned with nuts and crystallized fruits (to represent the gifts of the Magi). Traditionally hidden inside were two treasures: a small trinket said to render its finder lucky and a dried fava bean, which ultimately determined who had to bake (or buy) the cake the following year. Typically eaten on January 6 to honor the Epiphany, when the Three Wise Men visited the baby Jesus 12 days after his birth, the bolo rei is now enjoyed throughout the holiday season. Originating in France, it was brought to Portugal in the 19th century by the son of the founder of Confeitaria Nacional, a certified supplier to the Portuguese monarchy. Talk about it being fit for a king. Where to Find It: In Lisbon's Praca da Figueira, Confeitaria Nacional has been making the bolo rei using a secret family recipe for six generations. While you can buy it whole, I recommend ordering the cake by the slice and lingering in the timeless cafe with its elegant old counters and mirrored ceilings that reflect its glorious pastries. While the bolo rei was sold exclusively by Confeitaria Nacional in the late 1800s, it's now available in other pastelarias throughout the country. Sublime with a rich history—and filling—alfajores are eaten year-round but especially entice around Christmas, or Navidad. Translated from the Arabic word for "luxury," the sandwich cookie has been part of a centuries-old tradition in Spain and Latin America—particularly in Argentina, where it is now firmly embedded in the cafe culture. Historically, Spaniards were introduced to the treat when the Moors invaded the Iberian Peninsula and then later brought it to the New World. Alfajores differ by destination but are especially decadent in places like Buenos Aires, where they are filled with creamy dulce de leche and coated in powdered sugar (and sometimes shredded coconut) or chocolate. Although each cookie's two buttery disks might seem like just a vehicle for the caramel-like "milk jam" wedged between them, they stand on their own as confection perfection. The copious amount of cornstarch used in their making lends to a crumbly but tender texture that causes them to dissolve in your mouth. Dunk the whole cookie in coffee first to speed up the process. Where to Find Them: Argentine chain Havanna is a national favorite and sells alfajores in packages online as well as at its coffee shops. For an authentic artisanal take, visitConfiteria Caren in Buenos Aires, which offers what's considered the "original" alfajor. 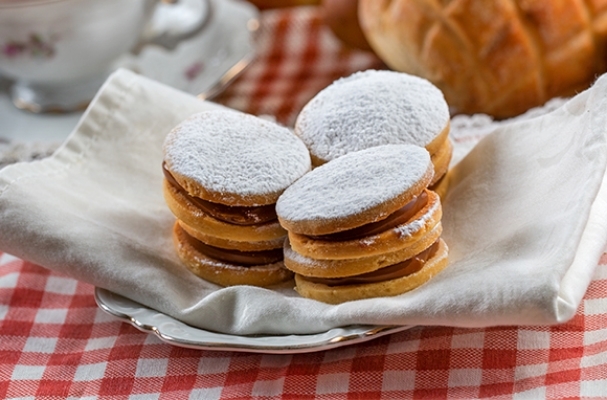 For more ideas, The Argentina Independent posted a list of its top five alfajores in the country. Few holiday desserts offer as much show-stopping excitement as a British Christmas pudding doused with brandy and set aflame. With origins going back to medieval England, the bowl-shaped fruitcake became most popular in the Victorian era, when it was prudent to preserve fruits and meats for the long winter months. Sometimes referred to as plum or figgy pudding, the dense and strongly spiced dessert is composed of a mix of dried fruits—such as raisins, figs, and prunes—held together by eggs, breadcrumbs, and sometimes suet (beef or mutton fat). Pressed into a bowl and steamed in a pot for several hours, it's usually prepared at least four weeks in advance (though often much longer) and has enough alcohol to allow it to keep forever (well, almost). Decorated with a sprig of holly and served with brandied butter or custard sauce, it's brought to the table glowing blue and with much fanfare. Where to Find It: Bettys in Yorkshire offers a "vintage" cherry pudding soaked in Port and ale as well as a classic version. Based in Devon, Figgy's Puddings makes them in small batches by hand with local ingredients; the company sells its puddings at Christmas fairs (which are announced on their Facebook page) and stocks them at a few retail outlets. In Austria, tortes like the famed Sacher and Linzer might try to steal the spotlight in pastry cases, but it's a small Viennese cookie that truly shines during the holidays. Crunchy but delicate, vanillekipferl, or vanilla crescents, are made by cutting cold pieces of butter into flour, then mixing in sugar and ground hazelnuts, almonds, or walnuts. The shortcrust pastry dough is left to rest and later rolled into ropes, sliced into even pieces, and carefully tapered and bent into the cookie's signature half-moon shape. After the baking and cooling process, a snowfall of vanilla-scented icing sugar adds an extra dose of sweetness. The crescents, now considered a Christmas treat, supposedly came to be when the Austro-Hungarian Empire defeated the Ottoman Turks in the 17th century and Vienna's defiant bakers celebrated by creating them in the likeness of the Turkish flag. As the story goes, the retreating army left behind coffee beans, which led to the establishment of the city's renowned coffeehouse culture, thereby popularizing a drink that happens to be the perfect accompaniment to the melt-away sugar cookie. Where to Find Them: During the holidays, you can sample vanillekipferl in Vienna coffeehouses and konditoreien, such as the famous Cafe Central and Demel. Adelheid sells handmade traditional Christmas cookies in it small storefront. 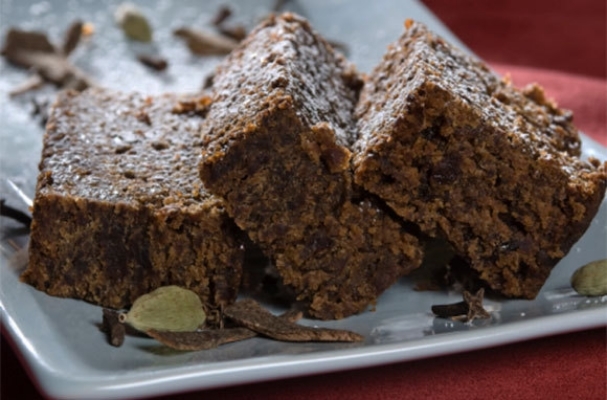 Descended from British plum pudding, black cake is an essential holiday favorite in the Caribbean, particularly in Trinidad and Jamaica. What makes it stand apart from other fruitcake is simple: the sheer amount of booze used to moisten and preserve it. Some islanders start making the special-occasion cake up to a year in advance by macerating dried fruits like prunes, currants, and raisins in local rum and storing it. The cake's dark color comes not only from the drunken fruit but also from the thick burnt caramel syrup found bottled in island grocery stores or handmade by cooking sugar past its smoke point until it turns nearly black. Aromatic spices such as grated nutmeg are also added to the mix, and the cake is baked slowly at a low temperature. Once out of the oven and cool, it's drowned in more rum and left to rest until it has absorbed every last drop. Where to Find It: As part of the holiday tradition, most locals bake their own black cake; however, some bakeries have recently started to offer it for sale. Kiss Baking Company in Trinidad is known for its custom cakes, and it's possible to find islanders selling authentic black cake to order. In Jamaica, the cakes are not generally available in commercial bakeries, but locals sometimes make them and supply them to supermarkets. In Holland, holiday cheer—and cookie consumption—starts early. Celebrated on December 5, the Feast of St. Nicholas (called Sinterklaas in Dutch) kicks off the season and signals that it's time for speculaas, a type of molded spice cookie. Thin and crispy (or sometimes cakelike), these delicately seasoned and slightly browned biscuits are lighter than gingerbread and pair especially well with hot, steamy beverages. Formed from intricate bas-relief wooden molds, they are quite beautiful, too. While speculaas are widely baked and enjoyed today, in the past, bakers developed their own methods and guarded their recipes under lock and key. Trade secrets included the specific ratio of spices, construction of the oven, and composition of the dough—referred to aspatroonsdeeg (or "patrons dough")—which was sometimes prepared months in advance so it could mature and better develop its unique flavors. Where to Find Them: Known around the world as "windmill cookies," speculaas are also popular in countries like Belgium and Germany and are commonly found in grocery stores year-round. However, in the Netherlands, they are served with coffee in restaurants and bars and are readily available in bakeries such as Patisserie Holtkamp in Amsterdam. At the Nederlands Bakkerijmuseuma (Dutch Bakery Museum) in Hattem, you can take in a history lesson and get hands-on during a speculaas-making workshop. With just wildflower honey, beaten egg whites, and plump Marcona almonds, the Spanish know how to create an addictive holiday candy without overcomplicating things. 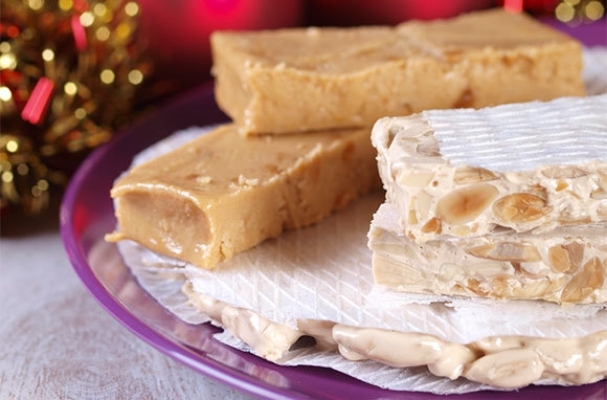 Found throughout the year but mostly enjoyed around Christmastime, turron (a type of nougat) comes in two delightful forms: hard turron, a brittle variation from the region of Alicante, and chewy soft turron specially made in the small village of Jijona. Each type uses different cooking techniques but incorporates the same classic ingredients; however, new flavors—with different nuts and fillings—have surfaced in recent years. Historically, the sweet confection seems to have hit its stride in the 1500s, particularly in Jijona (considered the birthplace and capital of turron), but its true origin lies much further back. Most accounts point to North African influences in the 11th century, and one common legend tells of a Moorish king who planted thousands of almond trees around his castle so their blooming white flowers would fall like snow to please his homesick Scandinavian bride; locals then gathered the almonds to make nougat, which became a winter treat to remind them of spring during the colder months. Where to Find It: Learn all about nougat history and production at the Turron Museum in Jijona. You can also indulge in the sticky-sweet confection at centuries-old shops in Barcelona, such as Vicens, Planelles Donat, and La Casa del Torro, which have been making it the traditional way for hundreds of years. In Greece, the New Year is rung in by the ceremonious cutting of a special cake. According to Greek Orthodox tradition, Vasilopita, which means "bread of Basil," brings a blessing upon the household in which it is served as well as luck for the coming year. Flavorings are always added to symbolize the sweetness and joy of life, but the ingredients and the style of the cake can vary drastically by region. Sometimes it's kneaded with olive oil, flour, and sugar and baked into a simple bread, while other versions are richer and more cakelike with eggs and butter. Zesty orange and lemon rind,mahlab (ground sour-cherry pits), and sesame seeds are common additions, and the coming year is often written on top with blanched almonds. Vasilopita is usually sliced by the most senior member of the family, and portions are dished out in a specific order (often eldest to youngest). The most blessed person receives the piece that contains a hidden coin, a tradition that goes back to the 4th century when St. Basil the Great distributed money to the poor through the sweetened bread. Where to Find It: Bakeries—and grandmothers—all over Greece typically make the vasilopita. 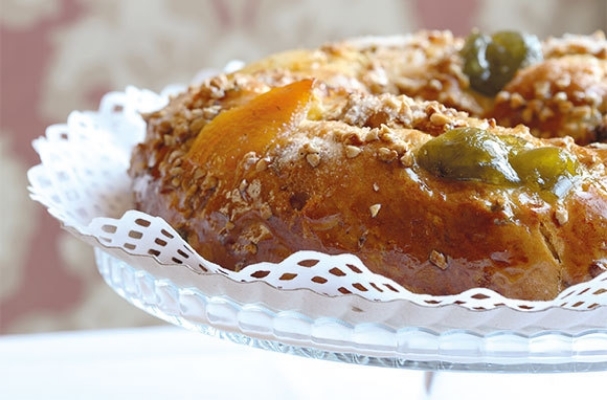 In Athens, Mr. Baker offers a variation with olive oil, cognac, and lemon, and Takis Bakery makes a sweet and tender tsoureki-style vasilopita with mastiha (gum-tree extract) and mahlab. Read the original story: Sweet Traditions: 14 Holiday Desserts Worth a Trip by Anne Banas, who is a regular contributor to SmarterTravel. The story is also featured on USA Today.